In their heyday, there were over 1,500 bandstands in Britain. Public parks and gardens were developed in Victorian Britain in response to a growing concern for health and wellbeing. Funded by local authorities and wealthy benefactors, music was seen to have an influence on moral health, and so bandstands became focal points for communal entertainment. Often designed with striking and intricate features, bandstands flourished until the Second World War impacted on the availability of material and recreational habits. Nearly 600 bandstands were lost between 1945 and 1980. However, a renewed interest in the value of public parks in the late 20th and early 21st centuries led to programmes of regeneration and restoration. Many historic bandstands have been given a new lease of life and brand new bandstands unveiled. This gallery of images from the Historic England Archive showcases a variety of England’s bandstands, past and present. Formerly open fields, the park was designed for walking and enjoying the scenery. It was completed in 1857 – meetings, games and dancing were forbidden. The bandstand was erected in the later 19th century and is Grade II listed. Gheluvelt Park is a war memorial named after the battle of Gheluvelt, which took place in Flanders in October 1914. The 2nd Battalion of the Worcester Regiment played a significant part in the action. Set on an island, the octagonal, cast-iron bandstand was a gift offered by the High Sheriff of Worcester. Erected in c1923, it is approached by a wooden bridge from the shore of an ornamental pond. The Royal Hospital, Chelsea opened in 1692. Designed by Sir Christopher Wren, it was built to house retired soldiers and still offers care and comradeship to British Army veterans – ‘the Chelsea Pensioners’. Since 1913 the lawns have played host to the Chelsea Flower Show. Held over five days annually in May, it is the country’s most prestigious flower show. The show’s popularity is such that it has been televised since 1958, the year that photographer John Gay recorded these visitors relaxing by a temporary, canvas bandstand. Open-air musical entertainment found ready audiences at the many seaside resorts that flourished during the 19th and early 20th centuries. The octagonal bandstand at Morecambe’s West End Gardens was a popular attraction for the host of summer visitors from the industrial towns of Lancashire and Yorkshire. Seated in a seaside deckchair, concert-goers could enjoy the music and views out to Morecambe Bay. Morecambe’s bandstands were lost after the Second World War. Scarborough is one of England’s oldest health and leisure resorts. Its health-giving waters were discovered in the early 17th century, and bathing in seawater soon followed. A local band played for visitors on the promenade from 1837 and by 1866 the Scarborough Orchestra had been formed. Bandstands were erected in Clarence Gardens, on the Esplanade at the Spa complex. Set on the edge of a paved terrace, The Spa bandstand backs on to the seafront promenade, affording audiences views of Scarborough’s South Bay. Constructed using steel, plywood and fibreglass, this unusual bandstand was unveiled on 8 December 2001. Designed by architect Niall McLaughlin, it was inspired by ideas gathered from workshops with local schoolchildren and architecture students. The shell-like canopy provides excellent acoustics, and its mobility enables it to be positioned anywhere on the Pavilion’s terrace, making it adaptable and reusable. The bandstand won a RIBA Regional Award in 2002. 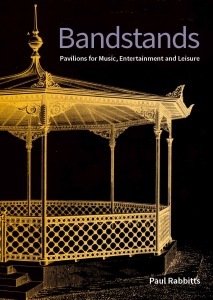 We’ve just published a new book on the fascinating history, decline and revival of bandstands in Britain. Featuring 244 illustrations, author Paul Rabbitts delves into the importance of music in public parks, the growth of the brass band movement, the foundries that built the bandstands, their architecture and their future.